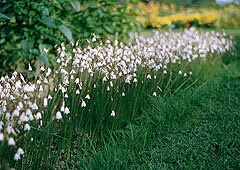 Smaller and earlier-flowering than Summer Snowflakes, Spring Snowflakes have fresh green foliage and dainty, bell-like white blooms. Prefers rich, moist but well-drained soil. Do not let soil dry out. Possibly hardy in Zone 3. White petals have a faint spot of green on each tip. Propagate by division or separation - Plant bulbs 3 to 4 inches deep in fall. Divide the plants after leaves have died or in the fall. Keep soil moist during the growing season. var. 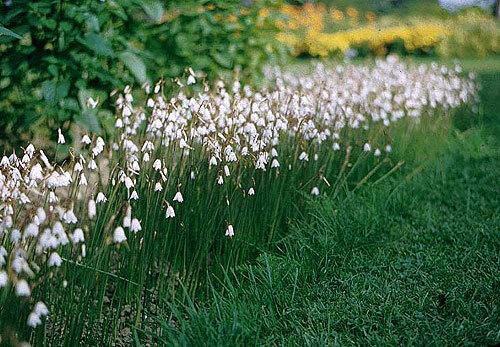 carpathicum: white blooms with yellow-tipped petals. var. vagneri: flowers earlier, in late winter or early spring.